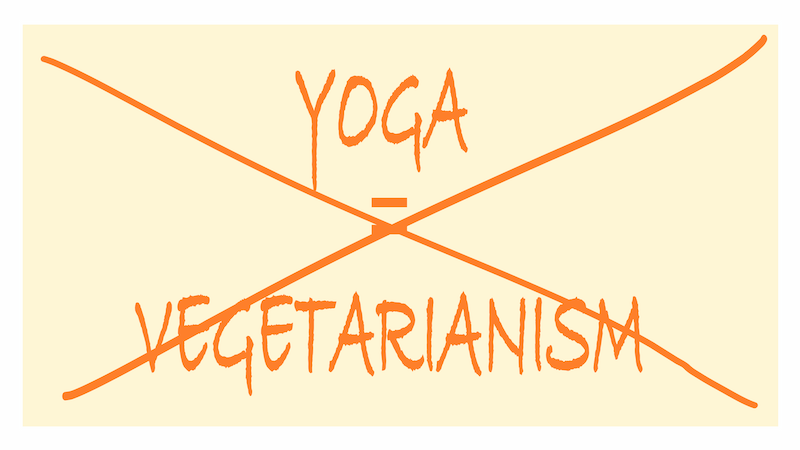 Yoga and Vegetarianism? I am a yoga teacher and eat meat. Home off the mat	Yoga and vegetarianism? I am a Yoga teacher. I eat meat. And I still do Ahimsa. I confess. I am a Yoga teacher and I eat meat. And fish. I have omelette in the morning and drink usual milk. Lord forgives me. But do you know what? This is NOT making me a worse Yogi. But there’s this strange phenomena about yoga and vegetarianism. Where does this crazy idea come from that you have to be vegetarian or even vegan in order to be a true authentic Yogi? Judging is not a yogic behavior. Eating meat can be part of Ahimsa (non harming) as well. Let me tell you about why I still eat meat. When I was in India I was vegetarian, almost vegan. In our Yoga TTC our diet was based on sattvic principles. That means no meat, no fish, no coffee or black tea. Just fresh curd and milk in the morning. The first time in my life I was almost completely vegan. And I liked it. I really didn’t miss anything. And I felt healthy and vital. Afterwards, on my following travels I kept the vegetarian and coffee/sugar free diet. When someone offered me chicken Masala or a beer, I intuitively reacted with reluctance. I guess it was my conscious and sensitive body responding immediately. My inner wisdom knew exactly what was good or not good for me. If everything was so great and good, why did I change? Yeah, fair question. What happened? That diet was great for me while I was in my mindful and tranquil Indian haven at the Yoga center. But then I got back to real life. First when I returned to Europe in July, I kept my eating habits from India. I stayed away from meat or fish, didn’t drink coffee or alcohol. It was summer and I was still in my summer break. Unconsciously I guess it was also a way of holding onto this feeling of Indian oasis in my mind. When I started the day with my self made masala Chai or ate my dal with the hands, my cells remembered every sensation they recorded from India. It felt good. For one or two months. Then my working hours increased. Besides other activities, I began to give 4 yoga classes per week. By bike I went from one place to another, to classes and back home, to the city center or the grocery store. Life got busier, faster. City life of blinking billboards and thousands of people walking around like ants altered my nervous system. Thinking about monthly income and professional future stressed my mind. And this yoga and vegetarianism thing didn’t work anymore. My yogic Indian diet just didn’t feel healthy anymore. I remember exactly the day I started to eat meat again. It was after a morning Yoga class. I was on my way home, on my bike, physically exhausted and thinking about chicken. It was not simply meat. It was chicken. My body asked for chicken for lunch. I screwed my vegetarian principles and made myself two big chicken filets and a huge salad. And with every bite I felt my body gaining more strength and vitality again. That was the day I realized that it’s not Ahimsa (non harming) not to eat meat, when you are harming yourself. But being self responsible and conscious about how you eat and what you do to your body. But why did eating vegetarian work for me in India with a daily 3-hours physical Yoga practice, but in Europe I couldn’t stand it two months? Well, let’s say it that way: All I did in India was practicing Yoga and Meditation (besides breathing and eating). My body got detoxed, purified, my mind still and my breath deep. I never felt more vital in my life. And the only thing I had to worry about was my spiritual evolvement and going inside of me. I got fresh cooked food and inhaled daily pure ocean air. Every damn day I worked with Asanas on my glands and nervous system. How can you not have a perfectly working body in such an environment? Back in Europe my lifestyle changed. Of course. There was much more to think about, to worry about. And thousand times more distractions from the outside. Thus my body and mind had to work with a different environment and different exterior stimuli. My body needed to deal with much more processes. That means there’s less energy and time to care about the right functionality of your body. When you are stressed your whole (hormonal, nervous, digestive) system gets out of balance. Second factor of why my Indian eating habits weren’t sustainable is the quality of the ingredients. Industrial products are just not as nutritive than those coming directly from mother earth or being super fresh made. and when i say fresh I mean fresh. That fresh that our curd (yogurt) was still bubbling because of the recent fermentation. Have you ever seen a curd bubbling when you pulled of the plastic seal? I am sure you didn’t. Keeping my vegetarian or even vegan diet would have been unhealthy for me. And Yoga is not radical and it’s free from dogmas. So why do people consider non vegetarians/ vegans not a true Yogi? There are two aspects in Yoga which let you consider a vegetarian diet (still the vegan part I don’t get). Both are absolutely logical and very fair to remember. I want to make clear at this point that I am not against vegetarianism or veganism (even if I don’t consider the second really healthy). Only I want to bring to mind the incoherency that often hides beyond strict interpretations and excluding concepts. Again: Yoga is free from dogmas. Yoga is a system of balance, not one-sidedness. And Yoga is a system for health (physically, mentally, emotionally, spiritually). Let’s remember that. Let me emphatically clear up one widespread misunderstanding. Nowhere in the Vedas or in the ancient teachings is it said that you must be a strict vegetarian. Westerners, in particular, seem to believe that to seriously study Yoga it is imperative to adopt a vegetarian life-style. This is not the case, and for some individuals may even be unhealthy. The whole story of yoga and vegetarianism came up with this wonderful principle of AHIMSA or non violence. It’s the first of five Yamas (followed by Niyamas). FOR THE YOGA NEWBIES: You can take the Yamas and Niyamas (part of Patanjali’s eight limbs of Yoga) like an ethical guide to living. And very essential aspects to practice when you want to live Yoga as a whole. So back to Ahimsa: What does it exactly say? You shouldn’t harm yourself. That is also Ahimsa. And that’s what I realized when I changed from my temporary vegetarianism to being a occasional meat eater again. So please, please, please. All those who are crazy about that whole being-vegetarian-is-being-a-true-Yogi story: Forcing yourself into that closed minded stigma is not making a true Yogi out of you. If it’s not healthy for you to stay away from meat, fish or other animal harming products. Don’t do it. There’s no point in it. The second reason that speaks for yoga and vegetarianism is the principle of prana and sattva. Sattva means pure, vital, conscious. The most important thing to think about for a Yogi is how to preserve their life energy, their prana. When it comes to nutrition, we also want to eat foods containing high level of prana. Dead animals don’t have any vital force left. Means they don’t contribute prana to our body. (Insider: Concerning this my teacher told me once that eating fish would be better in your pranic scale because they have lower life expectations than for example a cow.) So this whole part makes absolutely sense. We want ingredients that provides us with prana rather than it reduces. You wanna be a true Yogi? Then eat in a sattvic manner. That means not only to consider the brutality and suffering an animal went trough to be on our plate. And what it makes with your energetic system when you eat it. But it is also about a conscious consumption of products. And that includes not harming your environment, mother earth, animals and yourself. What you should consider, and that’s what I do, is a responsible and disciplined consumption. Not only when it comes to meat but with everything you eat. Do you really need to eat Mangos in Germany? Or latin american Chia seeds when you have flax seeds coming from your land? Where does your meat, your eggs, your milk come from? How many antibiotics did your chicken receive to look that plump? Think about the whole process and consequences behind the product you choose to buy. When you base your diet on imported products and industrial mass production, what’s the consequence? For you? Your environment? Your planet? Other people without having that luxury to buy cheap imported ingredients? Do you replace your meat with a tofu burger? Or your cow milk with soy milk? Do you think this is non violence? Ahimsa? Do you know what increasing demand of soy in the world causes? So the next time you judge a meat-eating Yogi, look in the mirror and watch your own habits. Let’s help each other in the yogic journey to more balance and higher consciousness in any aspects of life. Without judging each others habits or forcing ourself in narrow minded ideas and interpretations. Remember Yoga is about living from your heart, from this place of love and acceptance. In order to feel connections and oneness.